A few days ago, I posted the first recipe (Samusa Soup) from a lunch party we had last week. 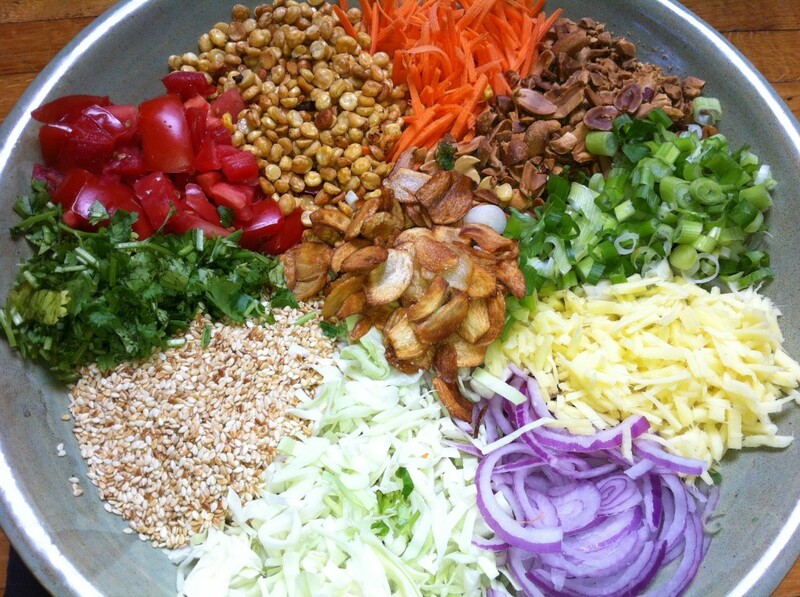 This recipe for Burmese ginger salad is #2! I was actually going to try and make Burmese tea leaf salad and ordered the leaves online on this site, but then I didn’t get the leaves until the night of the party. So sad! But this ginger salad is very similar and also fantastic. There are so many ingredients in this salad and they all come together wonderfully. If you lay out each ingredient separately in your bowl, it is really pretty too. Right before serving, throw on the dressing and mix everything together. This salad fed about 9 people a side salad portion. 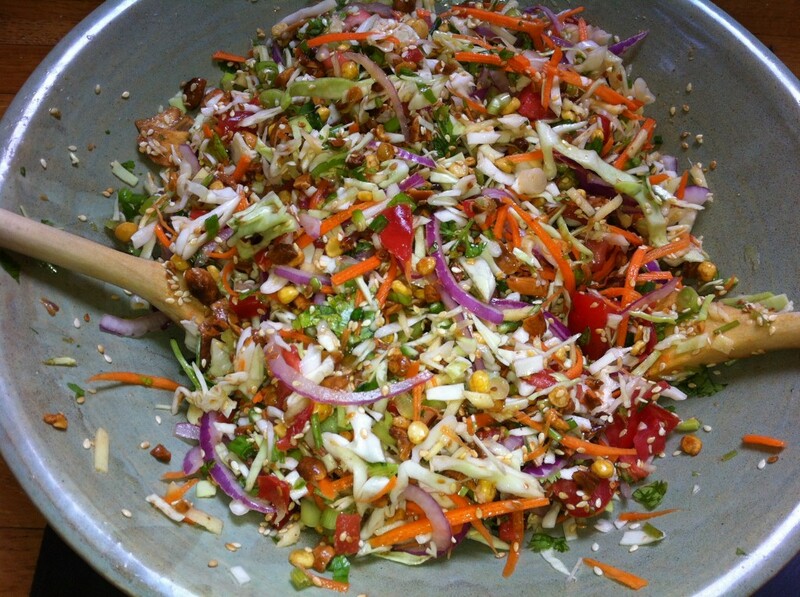 This recipe was adapted from New Asian Cuisine’s recipe for Fresh Burmese Ginger Salad. The dressing omits the fish sauce that is normally called for in this recipe. The chili paste with fermented soy beans gives it a little of that umami flavor. Mix all ingredients but the oil in a closable jar and shake. Strain out the fermented soy beans. Add the oil and shake once you have cooked the garlic (below). These measurements are approximate. For example I think there were a little more peanuts than sesame seeds, but not another 1/4 cup worth. Just adjust to your taste. Slice up the ginger and mix with the juice of one lemon and let soak 8+ hours or overnight. Soak the channa dal for 8+ hours or overnight as well. Drain and let dry a little. Prep your garlic and nuts – deep fry the garlic until browned (save the oil for the dressing), deep fry the channa until golden, roast the peanuts if they aren’t already roasted (I find that store bought roasted peanuts are still much better with a little further home roasting), toast the sesame seeds (see my comment about the peanuts, same with sesame seeds). Prep your fresh ingredients – slice the cabbage, shred the carrot, chop the tomatoes, slice the onion, chop the green onions and cilantro. Drain the ginger from the lemon juice. Arrange your bowl! I found that laying out the veggies (cabbage, carrots, tomatoes, onions) first made it easy to add the dried ingredients in the little spaces afterwards. Once ready to serve, throw on the green chilis and dressing and mix. There is a little more dressing that you probably need, so add it little by little depending on how much dressing you like. It was amazing!! So so good. such a mix of different tastes put together so well.